U.S. Secretary of Defense Ash Carter speaks at a news conference during a NATO defense ministers meeting at the alliance's headquarters in Brussels, Feb. 11, 2016. The NATO alliance may become a member of the U.S.-led coalition fighting Islamic State, Secretary of Defense Ash Carter said Thursday. Carter told reporters at a meeting of more than two dozen defense ministers in Brussels that NATO chief Jens Stoltenberg was exploring the possibility. The addition of NATO would bring the alliance's experience in building partner capacity and training ground forces, Carter added. All of NATO's 28 member states are already in the anti-Islamic State alliance, but only in the capacity of individual nations. The Pentagon chief said the group provided "unanimous support" for an operational campaign plan he laid out to defeat Islamic State. The plan focuses on destroying IS in Syria and Iraq, combating its metastasis worldwide and protecting from IS infiltration at home. Carter said he also offered the defense ministers an opportunity to accelerate their countries' contributions, which the United States has been doing for months. Earlier in the day, Carter spoke privately with some officials but also publicly shamed some unnamed countries in the 66-nation coalition for doing "nothing at all." The Netherlands announced last month that it is expanding its role in the fighting from Iraq to Syria, while Saudi Arabia's defense minister told Carter Thursday that the country was expanding its role in the air campaign. The coalition has launched more than 10,000 airstrikes against Islamic State targets in the last year and a half in Iraq and Syria, but the U.S. by far has launched most of the attacks, 68 percent of them in Iraq and 94 percent in Syria. 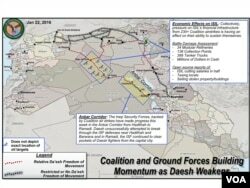 The U.S. estimates that the coalition and Iraqi forces have recaptured 40 percent of the Iraqi territory and 10 percent of Syrian lands that Islamic State had seized over the last two years. President Barack Obama's budget plan for the year starting in October calls for $7.5 billion to fight Islamic State, a 50 percent increase over the current year. Part of the spending calls for buying 45,000 more GPS-guided smart bombs to use against Islamic State targets.